Poison Bloom is picked from the poison bloom plants found exclusively in Darkfall Passage. If you approach the plant, but do not immediately pick it, it releases a gas that inflicts 15 poison damage for 6 seconds. 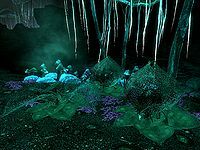 Poison Bloom shares a similar name to a spell in Morrowind, and several items included with the Area Effect Arrows add-on, all of which inflict poison damage. Poison bloom plants appear to respawn, but cannot be harvested the second time.